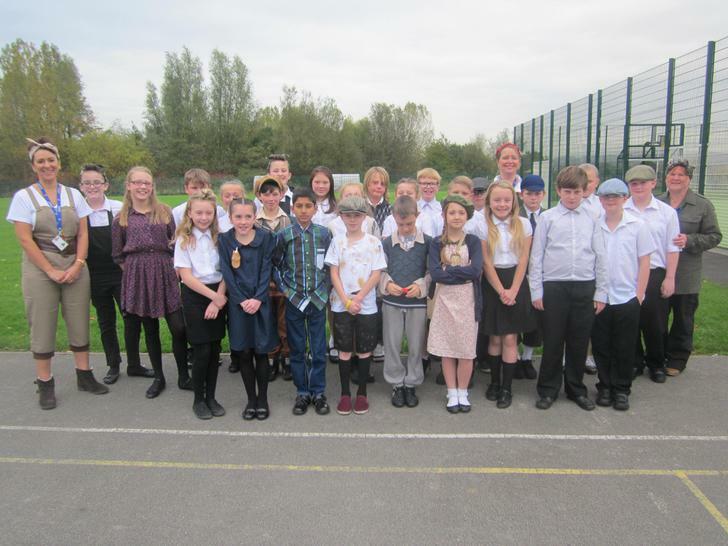 Welcome to our final blog of year 6! We can't believe how quickly the year has gone. We would like to wish your children every success as they move onto their chose high schools, it has been a pleasure to know and teach them. Have safe and happy summer. Hello and welcome to our last Friday blog! We have been practising our assembly to get it just right for next week - I am sure you're going to love it! Yesterday was our Olympic themed sport day - the children had a great time and worked well in their team countries. We made dinosaur s part of our Science/DT topic which was great, we definitely had some unusual looking dinosaurs! Today we went to Oxygen and bounced away on the trampolines, the children had a fantastic time (as did the staff) and it was good to celebrate all the childen's efforts over the year! Even though we are only a couple of weeks away from finishing year 6, we have still been working incredibly hard. We have done lots of writing based on The Highway man as well as learning and writing all about the Mayans! Your children retold the Maya creation story - these were a delight to read. In Maths we have been data handling and producing a range of ways to present data, such as: bar charts, line graphs, tally charts and frequency tables. We are learning all about evolution and inheritance in with inheritance being the focus this week, We have discussed how we might inherit characteristics from our parents. We have also begun our end of year assembly! Yes - OUR END OF YEAR ASSEMBLY!!! Can you believe how quick it ha gone?? Your children have been given scripts to learn which we would be really grateful of your assistance with at home. Well I have been away for most of the week with your children to Winmarleigh. We had an amazing time doing loads of activities which were great! We zip-wired, rowed, climbed ropes to name a few. The children loved it and they did me, the school and you as parents very proud. I'm sure that you have heard all about it - if the children still had any energy left to tell you that is! Children who didn't go to Winmarleigh had a great time in school carrying out a range of outdoor activities on the ALPs. In class, we have been designing Westfield Olympic flags for our in-school competition. Good luck everyone! Andrew and Hayley were chosen to go to an art exhibition to show a selection of art work to Lisa Nandy, our local MP. Well done. Hello and welcome back to our blog. We have had a mixed week this week after some children spent time at their new high school However, we have still got through lots of work! In English, we have been studying the poem The Highway Man by Alfred Noyes. The children have really enjoyed this and we began to write a story based on the poem. Our new topic is Mayans, we have found this really interesting so far and wrote a brochure advertisement on why people should visit Chichen Itza. They were great! In Maths, we have been solving problems and have interpreted pie charts. It's been a busy week! We are looking forward to Winmarleigh next week, hope the children who are going are excited about it too! Well as you can imagine, the children have worked incredibly hard this week with their SATs and we are tremendously proud of them. They tackled reading, spelling, punctuation, grammar, arithmetic and reasoning and did a great job with them all. Well done Year 6!! As a treat, we decided to hit the ALPs today and collect natural items to create a collage, which as you can see from the photos are lovely. We also managed to have a game of cricket which the children enjoyed. Hello! Well as you can imagine, this week has been all about revision! Your children have worked so hard, I'm sure they have been coming home and falling asleep! As well as lots of revision, we concluded our science investigation this week on how best to store bread to keep it most fresh. Ask your children about the results!!! Have a great relaxing weekend and we will see you on Monday. Well I am sure your children have all been telling you about hard we have been working and I’m also sure that they are coming home very tired! We have done lots of revision in Maths and English as well as writing about a fictitious pet and have continued with Victorians in Topic. We looked at some strange inventions and had to decide what they could have been used for – believe me, we had some very creative ideas! Science was all about how germs are spread so we designed a persuasive poster to encourage the school to ‘catch it, bin it, kill it’! Have a great long weekend and we will see you on Tuesday. Hello and welcome back to the Summer Term! We hope that you had a relaxing Easter Break and that the children are all set for the coming weeks. In class we have been really busy looking at angles this week in Maths. Children learned how to estimate, read and measure different angles as well as working out missing angles…fantastic! We have been learning about the subjunctive form in English and also looking at an animated film entitled ‘Before Sunrise’, which is about shadow-like ghouls, to get our writing juices flowing this week. Our classroom became a Victorian one this week as we gave the children a taste of what it would have been like then. We then wrote a contrast of the Victorian and Modern Day classroom. In Science we are learning about living things and have kick started our science with an investigation of why bread goes mouldy!? Have a great weekend and we will see you on Monday. Welcome to our final blog of the Spring Term! How time flies! We have learned so much this term from Living Things to The Victorians and Mean Average to Subjunctive Forms. And that's only scratching the surface! We hope that you have a great Easter break, that the children get good rest (teachers too) so that they are fuelled with enthusiasm for he start of the Summer Term. Children have been sent with homework to complete over the holiday which we will require first day back. Well the children have been super busy this week doing a mocks SATs week! They faced some really tough challenges, but tried hard to complete the tasks. In the afternoons, we have been studying William Morris (a Victorian artist) and replicating his work. Some of the art produced is amazing! We enjoyed reading with the younger children in Year 3 this week whilst the book fair was in school. Welcome back to 6W's blog, we have had yet another busy week! Maths has been all about coordinates, translations and reflections, the children did a fab job with this! Amazing writing was created this week after we watched clip of Tom Trueheart. The children wrote a story based on the clip, the writing blew us away - truly fantastic. We have begun to look at William Morris, a famous Victorian artist, in topic. We researched facts about him, looked at his wallpaper designs and drew our favourites. It was all about classifying animals in science which was great fun. World Book Day was a great success, enjoy the photos! Have a good weekend, see you Monday. Hello and welcome back to our blog. Hope you all had a great half term. We have had a busy start to the new half term spending lots of time on grammar and selling Perfect Punctuality to the rest of the school. This is something that children on the upper phase have been trialling and has been a tremendous success. In maths we have been looking at volume of shapes and the formulas to work this out. We carried out our own investigation in class finding the volume of objects around the room. Our new topic in Science is all about Living Things. We are looking forward to learning more about this. We have been looking at the work of Lord Shaftesbury in Topic and the incredible changes he made for children during the Victoria times. Remember our Parent and Child Workshop is every Wednesday this term so please let me know if you would like to attend. Thank you to those parents who came this week. Some of the work we have done this half term! Hello and welcome back to our last blog of this half term...how time flies!! We have had a really busy week this week and in maths we have been finding the area of triangles and parallelograms! The children have done a fab job on this. The children had a go at a Year 6 SPaG test and did really well. We also spent some time reading Gangster Granny as well as looking a coordinating and subordinating conjunctions! In topic we have been looking at the life of trapper. We listened to an audio of a boy who retold his story about what his life was like in the mines. The children then retold his story and did an amazing job at creating tension. Perfect punctuality has been a huge hit in class. We have noticed a remarkable difference. Thank you! Could I also remind you that I will be running a Parent and Child SATs workshop after half term, therefore if you are interested, please let me know as soon as possible after half term. Have a great week and we will see you soon. We wrote a recount of our fabulous trip to Quarry Bank Mill in English. We tried really hard to get our Y6 spellings in there and to write in passive voice! We have also been learning some new strategies to help develop our reading skills. We have been measuring in maths. Converting km to m, kg to g and even working out perimeter of some compound shapes. We solved problems relating to distance today, which all the children did a great job with. In science we have been looking at the dangers of smoking and how it affects our hearts. Children looked at healthy alternatives to smoking, like eating a healthy diet and regular exercise. Continuing with our Victorian topic we merged Oliver with Quarry Bank Mill and wrote a missing chapter from Oliver Twist! It all started when Oliver found himself at Quarry Bank Mill. We had some very interesting stories. It’s great to see your children making a significant effort to get into school on time in line with our bid for ‘Perfect Punctuality’. Well done to those children who have been in every day this week. Keep it up! Mrs Parry and Mrs Melling. In English we have been looking at one of our favourite authors, David Walliams. We then wrote a biography all about him! We found out some really interesting things! It’s all been about ratio and proportion this week in maths…the children got a very good grasp on this new concept. We have been looking at how a healthy diet is good for us in science and found out why sailors got scurvy…because of poor nutrition! Our Victorian topic continues and we were really excited to visit Quarry Bank Mill today to see what it would have been like as a child in those times. We learned a lot and are thankful that we didn’t have to do some of those jobs! We have been looking at reading strategies this week such as skimming and scanning to help us with speed and technique. We have also continued with Gangster Granny which is getting better every page! We have been converting percentages into decimals and fractions and finding out percentages of amounts. The children have done a great job with this. In science we have been looking t the heart. We carried out an experiment to see if our heart and breathing rate increased after exercise. We tried gruel and soup in topic to see what it would have been like for Oliver. The soup was definitely a favourite for the majority! Have a great weekend and remember we need the slips back for our trip next week. Also confirmation of attendance of the SATs meeting. We hope that you all had a fantastic Christmas break and enjoyed all the festivities. We have started David Walliam's book, Gangsta Granny. We are only a couple of chapters in but we can tell that we are going to really enjoy this book and get lots of writing opportunities from it. It's been fractions, decimals, percentages and more this week. The children have done a great job with this and can consolidate what they have learned in this week's homework. We evaluated our games that we made before Christmas, this was good fun! Our topic this term is The Victorians. The children have carried out some independent research and created a report about Queen Victoria and key events during her reign. Pupil of the week I Florence Barry, well done to her. Well here it is...last day of out first term and what a term it has been! Your children have settled really well into Year 6 and have worked considerably hard. Full credit to them! We hope that you all have a safe and happy Christmas and a fab New Year. We have had a great week looking at the John Lewis advert which has lent itself to all of our English work. We have listened to the song, watched the video and have produced some great writing from it from diary entries in role to poems. The children have loved it. We have added, subtracted, multiplied and divided fractions in maths and have done a great job with that. In Science the children are making their own circuit games which are now well underway and should be finished in time for the Christmas break! Have a good weekend, we will see you Monday. Remember it is the Christmas Party on Wednesday afternoon. What our English work has been based on this week. Hello and welcome to our blog for this week! Well what a week we have had! I am sure that you are all aware of the fact that we have had some strange goings on here at Westfield this week following the findings of an alien egg! This has led to a week of alien activities which the children have enjoyed. In year 6 we have done lots of descriptive writing around an alien theme and have been ultra-creative in D&T. We have designed and made our very own planets from where we think the alien might be from. We have had Planet Zod to Planet Blibberdy Blob! Have a good weekend and see you on Monday. Love from Mrs Parry and Mrs Melling. In English we have been looking at active and passive which the children did a great job of. We have also been building up on our super sentences and have had some fantastic adverbial phrases. We have been testing our multiplication skills in maths doing short, long and decimal place multiplication, it’s been tricky but we got there! We started our new topic on cities and capitals and looked at London for our first city which led to a great piece of writing. In science we have started electricity and even made our own circuits! We had a great time at the cinema today watching Paper Planes which we will build some wriring around over the next couple of weeks. Well what a busy week we have had this week! In addition to all our usual curriculum work, we have been involved with The Great Westfield Bake Off! What an amazing contribution we had and Mrs Melling and Year 6 made a fantastic octopus cake. Why Octopus? you might ask....well it was to link with our English work on the 8 parts of speech! We have spent today carrying out WW2 activities, we have had great fun making air raid shelters, spitfires, evacuee tags and more. It's been great. Children are to complete their learning logs over the holidays on this topic please to present to the class after the half term. Have a safe and happy break and we will see you on the 2nd November. 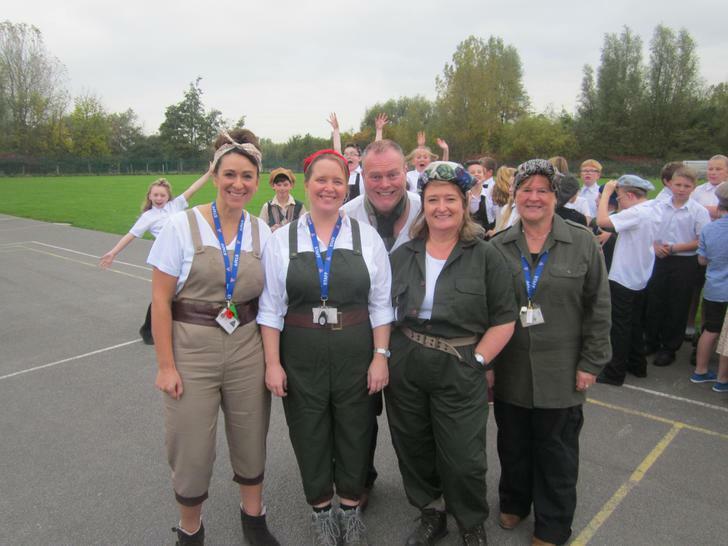 Hello again, welcome back to Year 6W's blog! We have been looking at plurals this weeks and understanding the rule of adding 'y', 'es' or 'ies'. We have also written our final draft for the Royal Mail Competition for our dream job. Wish us luck with those...fingers crossed! We have been adding and subtracting some really large numbers this week then applying our knowledge into problem solving. As our topic on light comes to a close, we have made our own 'professor' guides to light! This has summed up everything the children have learned about light over this half term. We got all hands on this week cooking and food tasting typical foods from WW2 times. The children made carrot cookies and a vegetable stew and most of them enjoyed tucking in! Pupil of the Week is McKenzie for his determination and resilience and Star of the Week is Brandon who unfortunately leaves us today. good luck Brandon, we will miss you! 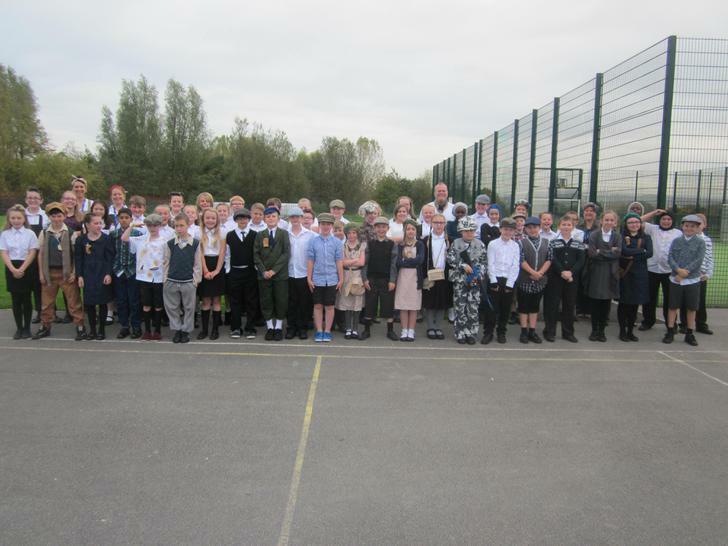 Letters have been sent home regarding WW2 day next Friday where children can dress as evacuees or in 1940's style. It will be a fun day! We have been looking at letter writing this week and in particular writing a letter for our dream jobs! We had some really interesting ideas from rally car drivers to chief cake tasters! We have spent time in the book fair with Reception and Year 3 sharing stories which has been lovely. Addition has been our focus this week looking at numbers into the millions and adding decimals. The children have been challenged but have worked really well. Keeping with our Light topic, we made our very own periscopes in Science this week. It was a bit tricky but with perseverance we got there and had great fun using them in class. Topic has been a treat this week. We watched a clip from Blackadder and told the children they had to write a poem with each line starting with Boom! Boom! Boom! We have also drawn caricatures of leaders during WW2 using charcoal. We have some very talented artists! Thank you all for dressing your children as Super Heroes in line with the book fair’s Super Readers theme. We had a good time sharing the books today. A huge well done to Lewis for being chosen for Pupil of the Week for his caricature of Hitler and to Ellie McGuire for being the class Star of the Week. We have been exploring what life was like pre World War 2 and have just begun to write a non chronological report on this. We looked at food, play, work and homes during this time and arranged our work like a newspaper report using the passive voice. A great effort was made by all. Well done! Place value has been the main focus this week and we have even looked at numbers in the millions! Then we moved on to rounding which the children did really well with. Reflection and refraction has been our topic this week. We carried out an investigation which showed that when a light source hits a shiny surface, the angle of reflection is the same as the angle of incidence...highly scientific stuff!!! We watched Goodnight Mr Tom in topic in order for the children to gain an insight into what life as an evacuee would have been like. Following this, the children write a review of the film using Imagine 3 and 2AD simile sentences. Well that's all for this week, enjoy the weekend and see you on Monday. We looked at the story of Brashem's Tortoise. We looked at pictures from the story before we read it and asked the children to predict what the story might be about. Although the children made some great predictions, they were surprised when they realised who Brasham was! We continued with shape this week and looked at properties of triangles. We then had a go at making our own nets. We carried out experiments this week looking at shadows and what caused them to get bigger. We then carried out an experiment on refraction! In topic we looked at the Allies and Axis of WW2 and identified these on a map. We also create some factual reports based on research we carried out last week. Congratulations to Kaylee for being Pupil of the Week and Josh Bentham for Star of the Week. Well done to both of them! We have been spending some time on our writing this week looking at a range of super sentences, but in particular, Imagine 3 sentences. We have also been using spotter and finder skills in reading and broadening our knowledge and understanding in a range of texts. I maths we have been exploring shapes. We went out on the ALPs looking for a range of shapes nd their properties. Your children have learned vocabulary such as parallelograms, rhombus, obtuse, acute, right angles, quadrilaterals and the list goes on!! Our topic we are looking at light and carried out an experiment that showed us that light travels in straight lines. We have begun The Battle of Britain in topic. The children listened to a recording of Neville Chamberlain's speech and wrote a diary entry based on empathy. The writing was stunning. A big well done to Andrew for being pupil of the week and Nikola for being my star of the week. 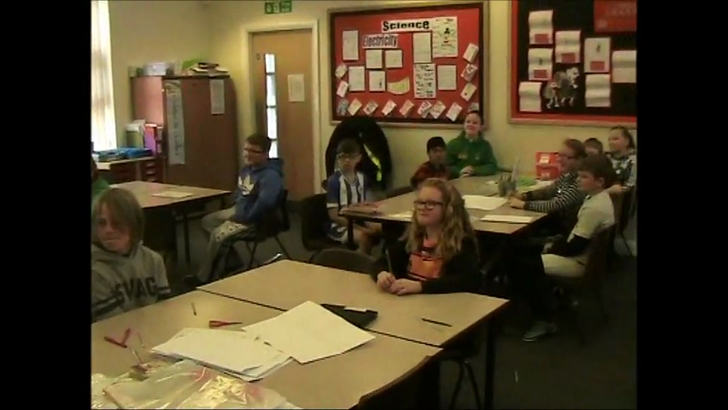 Hello and welcome to Year 6 W blog. We have had a great start to Year 6! Your children have settled in fantastically well and have been a delight to have in class. We have made a great start in English and Mrs Melling and I are incredibly impressed with the children's writing. Onwards and upwards! We have also been discussing our aims and ambitions and what we want to achieve in Year 6, it is very pleasing to see that the children have a strong work ethic and respond to high expectations in Year 6. I am sure that we will have a great year ahead. Just to remind you that PE is on a Friday so please ensure that children have their PE kits on that day.